This action packed festival will be held at Winton Motor Raceway over two full days. 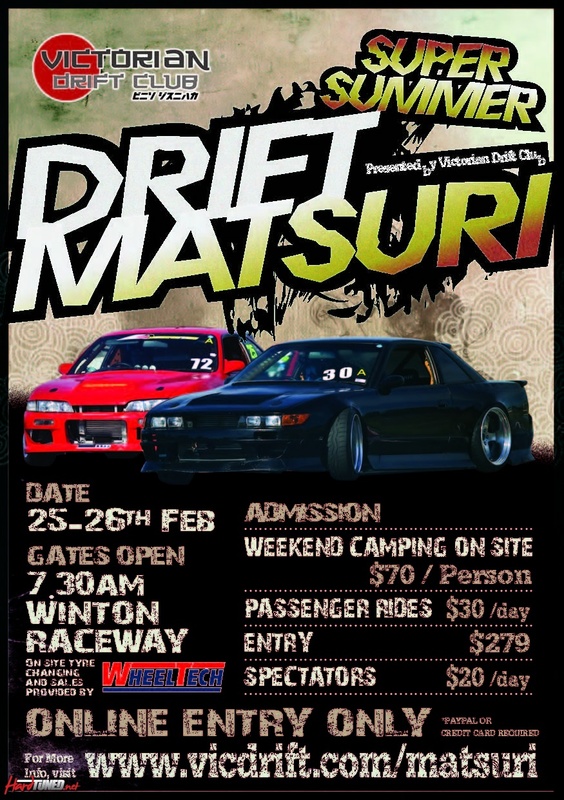 Looking to bring drivers from across Australia together, for the ultimate weekend of drifting. 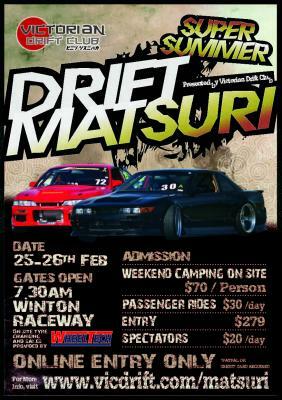 Drift Matsuri offers drivers maximum track time with no competition or beginners section slowing things down. A very popular format occurring in Japan, which many drivers fly overseas to experience but can now enjoy at Winton Motor Raceway. The level of drifting displayed will be intense with many pushing the limits of their cars and making the most of this unbelievable format. It will certainly get interesting with many high level interstate drivers also making their way down to see what Victorian drift is all about. Tickets can be purchased at the gate and are only $20 on Saturday and Sunday. On site camping is also available and can be organised via Winton Motor Raceway. Passenger rides will be available for entrants with approved roll cages, make sure you don’t miss out on seeing the action up close and personal. There are 150 spots available at a cost of $279 per driver. This allows the entrant to drift on both the Saturday and Sunday of the event. This fee also includes the gate fee for both driver and 1 x pit crew for both days. The track will be open for drifting on Saturday from 10am-10pm and Sunday from 10am-5pm. There will be 4 groups (A, B, C and D) which alternate during the day. Each group will get a 30 minute session before leaving the track for the next group to begin their session. Drivers must attend the compulsory drivers briefing at 9:00AM each day to receive your drivers armband or you will not be able to drive. Is there a beginners section at this event? No, there is no beginners section. Drivers who are not confident or who have only attended a few events at Winton are encouraged to select Group “D” so they are placed with driver’s of a similar standard. Registration will be open from 7am-9am in the Credentials Office outside the front gate at Winton. You will be required to show your current AASA or CAMS license when registering and sign your indemnity form. After registering, all drivers will be required to get their car scrutineered. What if I get there after 9am? You can complete your registration at the Scrutineering Office inside the Winton gates. Are there any scrutineering requirements for my car? Our entry system is based on the driver not the car. If you want to swap cars with your mates and you are registered as a driver then by all means you can swap cars with mates. The insurance covers the driver not the car. It is quite common at Winton that 2 drivers will share 1 car. Drivers entry fee also covers them to be able to passenger in any passenger approved car, e.g. has a half cage at a minimum. Each driver must complete their own registration. The cut off for cancellations for this event is: Monday 20th of February at 6PM. Please ensure you call Winton Raceway in advance on (03) 5766 4235 to ensure your fuel requirements are met. Can I reserve a pit bay? You can reserve a carport (at the top of the hill) for $130 for the weekend or a garage (down the bottom of the hill) for $250 for the weekend. These will be allocated on a first come, first serve basis. These can be organised by phoning Winton on (03) 5766 4235. You can always try your luck and see if there are any bays free on the day and use them without charge. Charges apply for the garages and must be organised prior to the event with Winton Raceway. Can I drop my car off on Friday night? Yes, you can drop your car off on Friday night until 7PM to respect the residents close to the track. You can camp on the Winton Motor Raceway site at the rear of the Shannon’s straight. The camping area features toilet and shower facilities and is well lit for safety. The area will be patrolled by security guards. To book your camping, please call Winton on (03) 5766 4235. This needs to be done at least 1 week prior to the event. How much is to come and watch the event? Gate entry is $20 per day. Can I go for a passenger ride? You can purchase a pass that enables you to be a passenger for $30/day. You will need to wear long pants, have long sleeves and wear a helmet. All cars providing passenger rides must have a half cage at a minimum. Vicdrift will not have a dedicated passenger ride car so you will need to organise for a driver to take you out. Can I buy food at Winton? Yes, Winton has a canteen where you can buy food and drinks. Alcohol can only be consumed in the camping and spectator areas. The pits is a dry zone. Drivers must not consume any alcohol (they must be at 0.00 at all times). Drivers may be breathalysed at any point during the event. Can I volunteer to be a track official at this event?